Ron Loyd has a BFA and MFA in Painting and Ceramics from Texas Tech University. He has studied Animation at the School for Visual Arts and Film Studies at New York University, New York, NY. 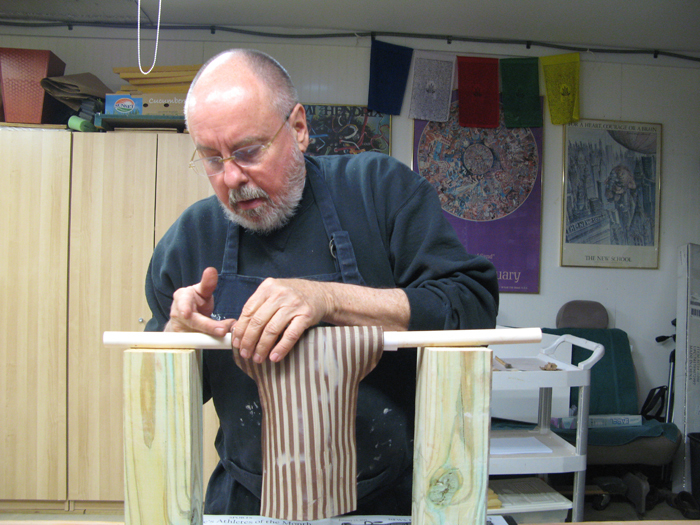 He studied with renowned ceramicist Bill Van Gilder. As an educator, he taught numerous Fine Arts programs in the Washington DC Metropolitan Area for fifteen years. He was selected in 2004 a Fulbright Memorial Fund Teacher and Washington Post Fellow sponsored by the Japanese Embassy. Earlier in his professional career, he tutored world-renowned artist Philip Pearlstein for his first laser CD “Drawing the Figure”. He coordinated music videos for Andy Warhol’s Factory and Island Record’s Will Powers. Supervised album covers for CBS Records and MCA’s Joe Ely. As a Director of Corporate Marketing Services, he implemented worldwide corporate identity programs, created product marketing materials, supervised annual reports, coordinated national tradeshow/sales conferences, and managed corporate web sites.